With 45million flowers in 72,000sqm area and all are surrounded by a flower-decked wall, Dubai Miracle Garden is the most beautiful and largest garden in the World. 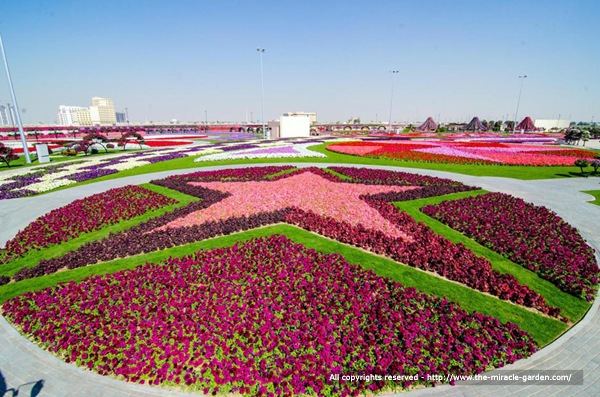 According to spokesperson Dubai Miracle Garden is currently going for a Guinness World Record for the longest flower wall with a 1km circumference. The most beautiful garden opened on Valentine’s Day this year. Most of visitors named it as a “little piece of Eden” on earth. It is located in Dubailand near Arabian Ranches. Flowers are decorated in shapes of Heart, Stars, Different styles of Circles, Flower Pyramids, Igloos, Flower-decked vintage Cars, Different style Layers, Water Bodies, arc-shaped walkways, Colorful Umbrellas Covered Pathways. All of them are patterned beautifully that every inch of garden has its own uniqueness. The Garden features type of flowers which have never been planted in Gulf region before like Calendula, Marigold, Petunia etc. The Garden is developed by Akar Landscaping and Agriculture Co. This is the same company that developed Al Ain Paradise near the Oman border. Al Ain paradise consists of 10million flowers and the size of garden is equal-ant to four football fields. Retail outlets, restaurants, souvenir shops, plant nurseries and a multi-storey car park will form part of the destination in the second phase of its development. Work will start on site in mid-2013. Developers are hoping to attract one million visitors a year once fully operational.